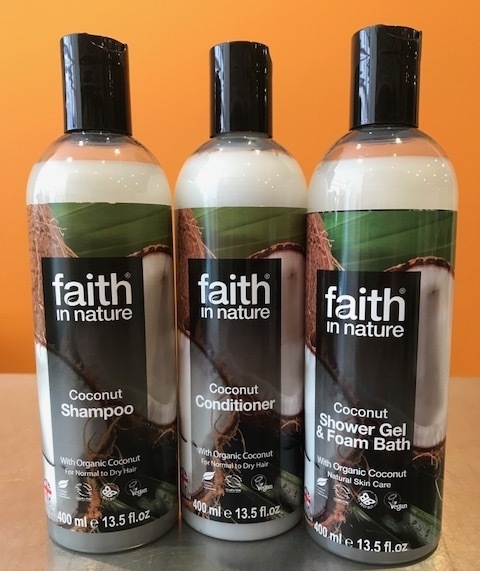 We have been selling a limited range of Faith in Nature products for some time now, but have recently expanded the range. You can now purchase shampoos, conditioners, moisturisers, body wash and soap from this traditional British brand, voted Number One hair care brand in the Health Shop sector! Started in Scotland in the 1970's, Faith in Nature is still run by its founder, Rivka Rose who moved to the UK from New York. She developed her original moisturiser to combat the harsh Scottish weather! 40 years later, and with 40 years heritage, what Faith in Nature stood for then is still true now; Ethics, Quality, High standards, Value for money. Read more about Rivka and her story here. We'd love to sell more of the Faith in Nature range, but that all depends on you! Tell us what you like (and don't like) and we will do our best to source it. Most importantly come in to our Colomberie shop and try them. We will only increase stocks when we know there is a local market for them. Why not receive all of these benefits by trying out grapefruit and orange shampoo, conditioner, hand wash and foam bath! Coconuts are highly nutritious, packed with essential vitamins and minerals. As well as having great health benefits Coconut oil can be used on hair to keep it strong, healthy and nourished and on the skin as a great natural moisturiser. Part of our award winning range of products, our natural skin care products have been created with carefully selected certified organic and natural ingredients, all of which deliver outstanding results at real value for money prices. Our entire range is hypoallergenic, SLS, paraben and MI free, as well as being natural, vegan and animal cruelty-free. Using the best of what nature has to offer, our natural skin care products range is equally suitable for both men and women. Why not consider other products in our natural skin care range including intensive moisturising cream, restorative hand cream or our coconut body lotion. Faith in Nature, a natural beauty expert for over 40 years, creates 100% naturally fragranced products from hair, body and skincare to home and pet care. Our award-winning range is suitable for a wide breadth of hair and skin types, and is fragranced with the incredible scents of nature. Made with the best of nature’s ingredients, our cruelty-free ranges are developed to be effective yet gentle on our bodies and the planet, offering high quality products for all the family. We’re about more than just beauty. Faith in Nature’s strong ethical credentials have resulted in our products being endorsed by The Vegan Society and Cruelty Free International. They’re free from nasties like animal products, SLS, GMOs, parabens, artificial preservatives and scents, and we pay particular attention to our packaging, working tirelessly to reduce unnecessary waste.